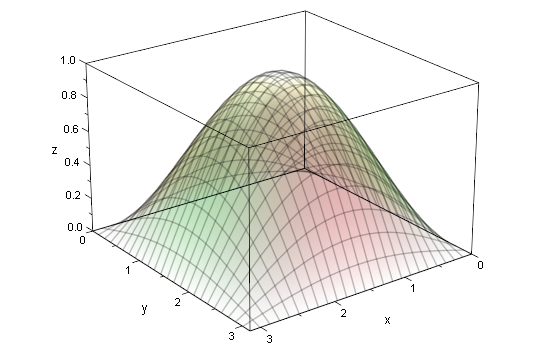 Sequential Monte Carlo (SMC) methods are usually designed to deal with probability distributions of increasing dimensions. 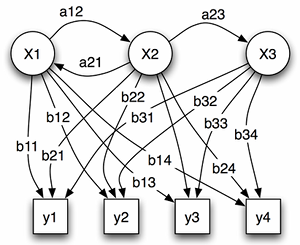 The canonical example is the sequence of distributions where is a hidden Markov chain and is an observation process. The notation is a shortcut for . This is usually called a Hidden Markov Model in the literature. 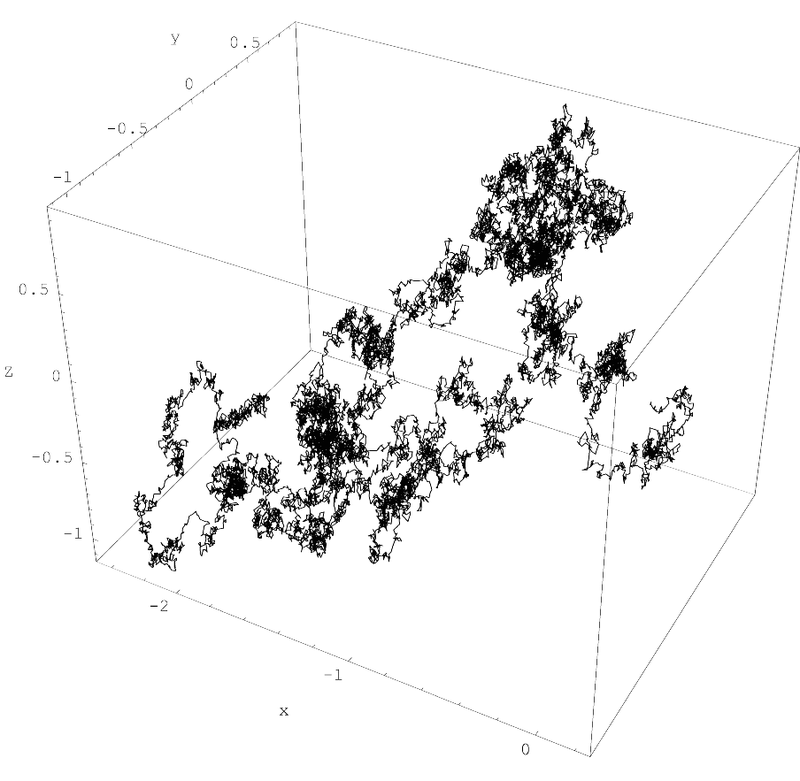 If the Markov chain evolves on in then the distribution is a probability on . where are Markov kernels in the sense that for any we have . The distribution lives on and one can use the traditional SMC methods to explore the sequence of distributions . 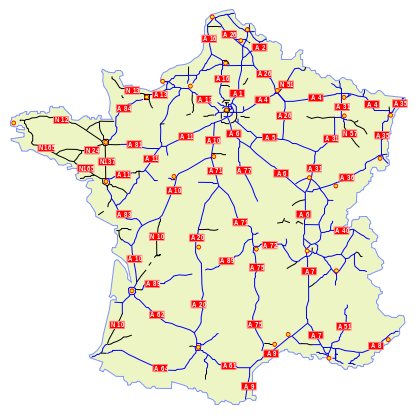 This algorithm was devised a few years ago by Pierre Del Moral, Arnaud Doucet and Ajay Jasra. It is extremely powerful and several other algorithms can be seen as particular cases of it. Because I had never implemented the algorithm before, I tried yesterday to see how this worked on a very simple example. My target distribution was an equal mixture of seven Gaussian distributions in with unit covariance matrices and centred at the vertices of a regular heptagon with radius . 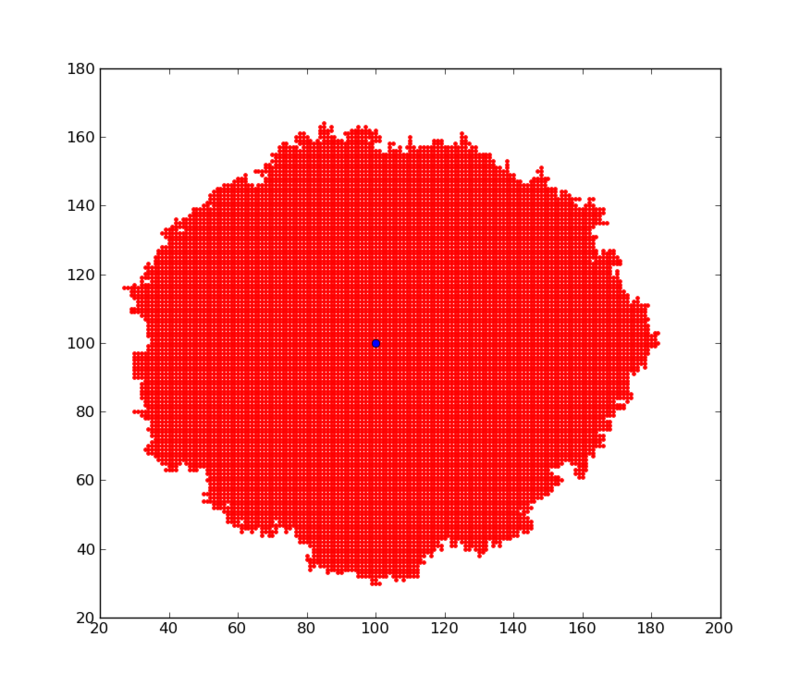 I started with particles at the centre of the heptagon and let them evolved according to a random walk. When the Effective Sampling Size (ESS) was too small (less than ), the whole particle system was regenerated. In order to obtain a sweet movie, I used bridge distributions . The result is clear and quite impressive. Indeed, this could have been made much more efficient by taking much less bridge distributions. 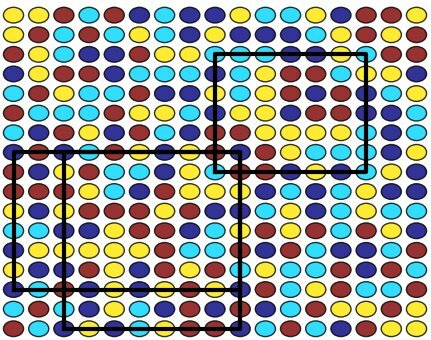 Some recent theory has been developed to analyse the stability of the algorithm in high dimensional situations. The analysis described in the article uses a scaling limit approach very similar to some ideas used to analyse MCMC algorithms and some more recent developements along the same lines that we have done with Andrew and Natesh. Very exciting stuff! I received several emails asking me to describe how to obtain the short animation showing the evolution of the particles system. The code is available here. This is a quick python script producing a bunch of .png files. It then suffices to stick them together to obtain an animated .gif file. This can for example easily be done using the free (and very good) photoshop-like software GIMP. Open all the png files as different layers. Export the result as a .gif file with the option ‘animated gif’ checked. Voila! Alexandros Marinos has just found a new solution to the Challenge 17 problem. His solution only contains 3 rectangles. This is the best solution (6 November 2011) known so far. Congratulations to Alexandros for this amazing achievement! In many situations it might be useful to know how to sample a Markov chain (or a diffusion process) between time and , conditioned on the knowledge that and . 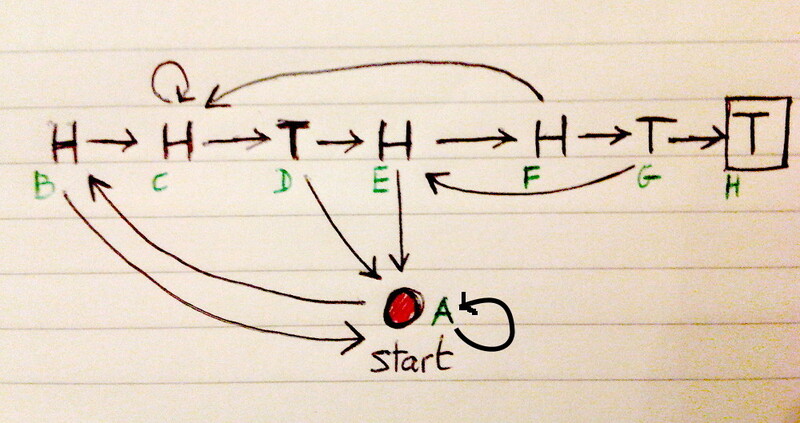 This conditioned Markov chain is still a Markov chain but in general is not time homogeneous. Moreover, it is generally very difficult to compute the transition probabilities of this conditioned Markov chain since they depend on the knowledge of the transition probabilities of the unconditioned Markov chain, which are usually not available: this has been discussed in this previous post on Doob h-transforms. Perhaps surprisingly, this article by Michael Sorensen and Mogens Bladt shows how this is sometimes quite easy to sample good approximations of such a conditioned Markov chain, or diffusion. In words, this means that looking at a trajectory of this Markov chain, this is impossible to say if the time is running forward or backward: indeed, the probability of observing is equal to , which is also equal to if the chain is reversible. This is precisely this property of invariance by time reversal that allows to sample from conditioned reversible Markov chain. Since under mild conditions a one dimensional diffusion is also reversible, this also shows that (ergodic) one dimensional conditioned diffusions are sometimes quite easy to sample from! 2. One dimensional diffusions are reversible! The other someone told me that almost any one dimensional diffusion is reversible! I did not know that, and I must admit that I still find this result rather surprising. Indeed, this is not true for multidimensional diffusions, and this is very easy to construct counter-examples. 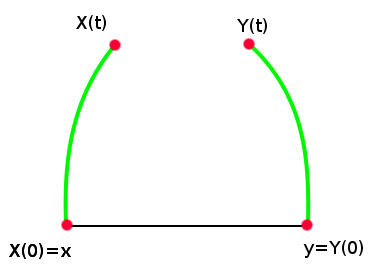 What makes the result works for real diffusions is that there is only one way to go from to , namely the segment . Indeed, the situation is completely different in higher dimensions. so that . 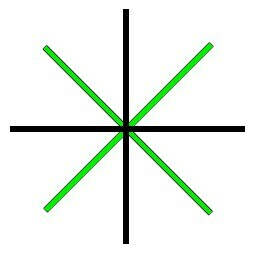 Interating we get that for any we have : the conclusion follows since . This simple result on skip-free Markov chains gives also the result for many one dimensional diffusions since under regularity assumptions on and they can be seen as limit of skip-free one dimensional Markov chains on . Indeed, I guess that the usual proof of this result goes through introducing the scale function and the speed measure of the diffusion, but I would be very glad if anyone had another pedestrian approach that gives more intuition into this. if there exists such that then define the path by and otherwise go back to step . 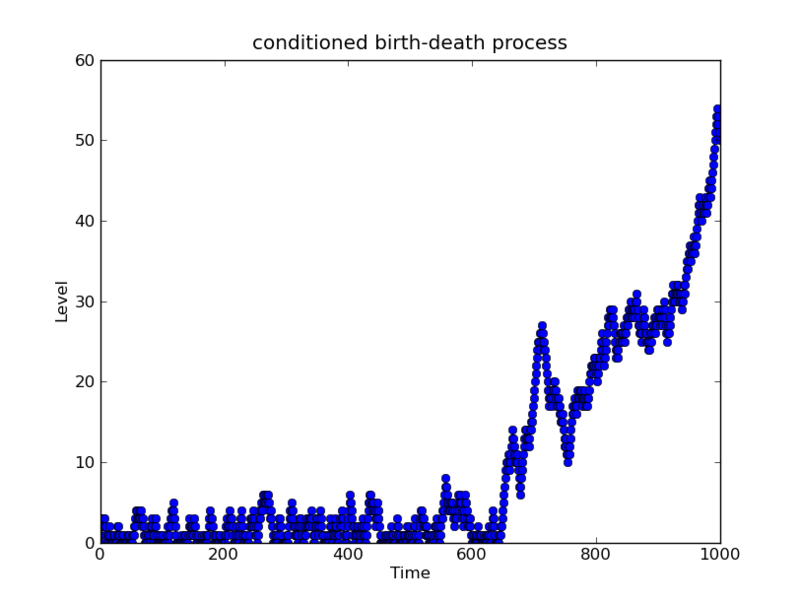 For example, here is a sample from a Birth-Death process, conditioned on the event and , with parameter . It might be interesting to notice that this method is especially inefficent for multidimensional processes: the probability of finding an instant such that is extremely small, and in many cases equal to for diffusions! 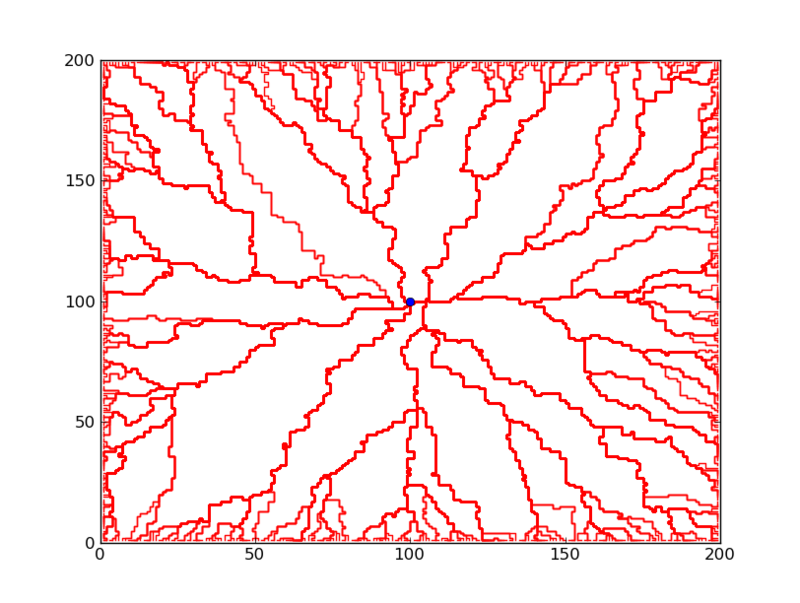 This works pretty well for one dimensional diffusion thanks to the continuity of the path and the intermediate value property. Nevertheless, even for one dimensional diffusion this method does not work well at all when trying to sample from conditioned paths between two meta-stable position: this is precisely this situation that is interesting in many physics when one wants to study the evolution of a particle in a double well potential, for example. In short, sampling conditioned (multidimensional) diffusions is still a very difficult problem.